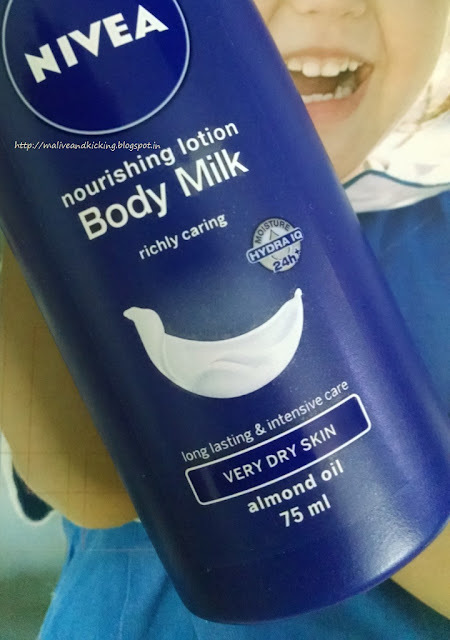 Try Nivea Nourishing Body Milk Lotion to meet the special neds of very dry skin.This rich and creamy formula with Hydra IQ and Almond Oil deeply moisturizes and softens your dry skin effectively. Ingredients: Shown in image below. Nivea Nourishing Body Milk Lotion comes in a traditional blue color plastic bottle. It has flip open cap bearing the brand name engraved on the top. I got a small pack size of 75ml (priced at Rs 110) which is so nifty and readily accessible to throw in your vanity kit due to its size and light-weight. 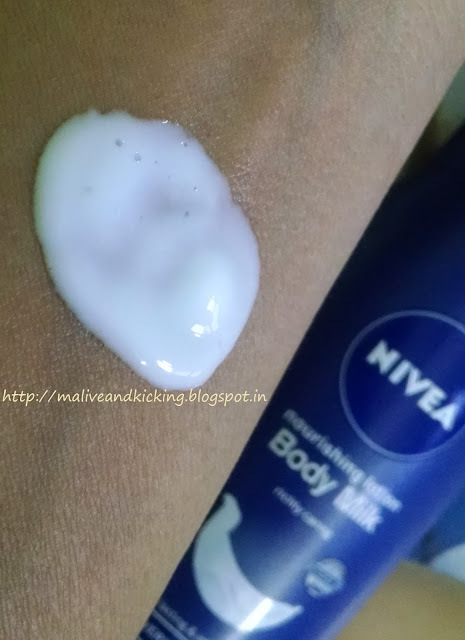 Nivea has variety of body lotions for varied purposes and for different skin types. But for the extra dry skin type like mine, I opted for Nivea Nourishing Body Milk Lotion formulated for Very Dry Skin. The product comes from Nivea's Hydra IQ Line that is an innovative skin hydration technology based on glyceryl-glucose compound. Hydra IQ boosts tissues' ability to retain water n results in long-lasting moisturization of cells. 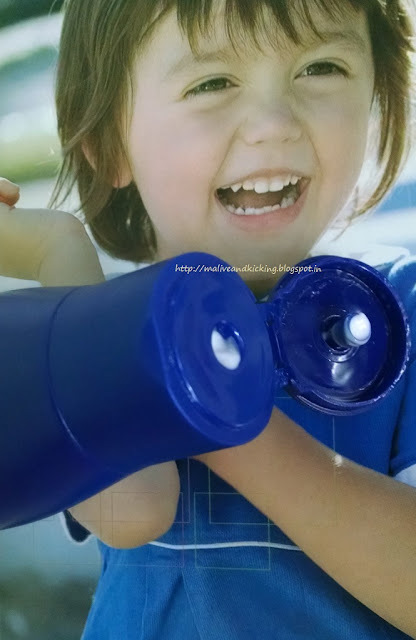 The milky-white colored body lotion is of medium consistency. Its runny, but not watery thin. Infact the creamy rich texture and its consistency together make the body lotion so easy to spread and blend in, that it disappears into skin in no time when applied. 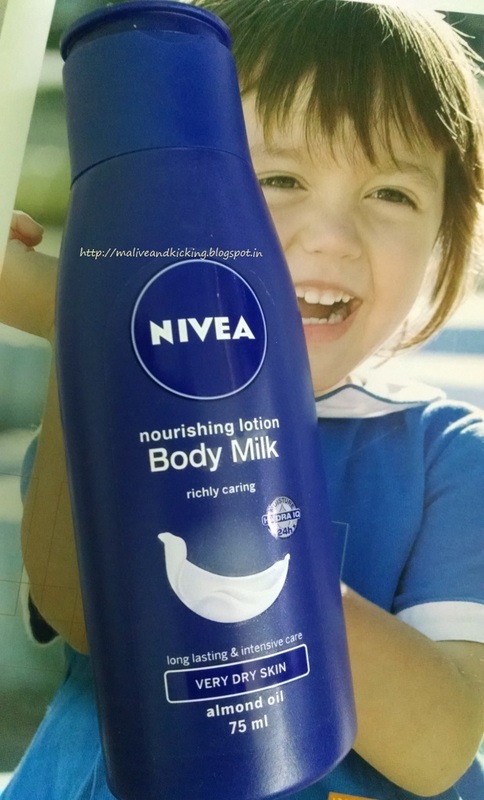 Like many other Nivea products, I love the delicate scent of this body lotion too. The scent doesn't last long but leaves a faint smell behind that you can whiff briefly if brought closer to your nose. I would have loved it more with bit strong fragrance. I usually apply the body lotion post shower on my damp skin, so that it seals in the moisture for longer. Despite being light on skin, the body lotion works to repair skin dryness layer by layer and stimulates moisture production naturally as desired, because it is enriched with Almond Oil. Its regular application smoothens the skin and imparts a glow to the skin. At times, my skin craves for more hydration than this body lotion offers. So I need a re-application after few hours depending on how and where I'm spending my day. And I don't mind it provided its offering my skin its daily dose of hydration curing flaky, itchy and tight skin issues. 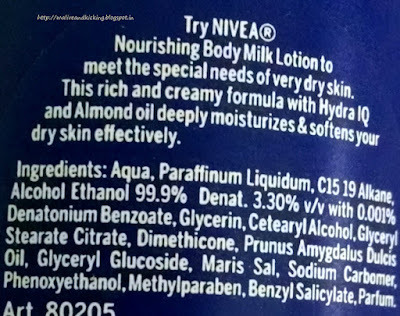 In a nutshell, Nivea Nourishing Body Milk has efficacy to impress with intense care for normal to dry skin. Its easily available at departmental stores and at online portals. at pocket-friendly prices. NICE REVIEW. ALTHOUGH I HAVE A COMBINATION SKIN, I'LL TRY USING IT DURING SUMMERS. its not extremely greasy, so can be used on combination skin occasionally depending on changing weather or skin requirements etc.. DOES IT WORK GOOD ON OILY SKIN? its not extremely heavy or greasy, so if oily skin needs hydration for certain reason like season change etc, then it can be used. This is one of my all time favourite body lotions. Nourishes my skin well without feeling greasy.